Apart from being excellent in quality, our Soybean Meal is available at the most discounted price in the Industry. Our Soybean Meal has high nutritional content for which it is famous in the national and international markets. We provide Soybean Meal that has high nutritional contents such as protein, carbohydrate, etc. We are a No 1 exporters and suppliers of soybean meal in India. We are one of the leading suppliers and exporters of soybean meal to various countries. 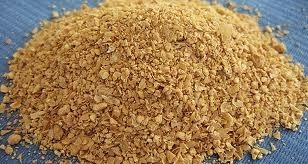 Soybean Meal contains minerals like calcium, magnesium, iron & folic acid, hence it is used by Pharmaceutical industries. Soya bean meal is ideal for Poultry Feed it's protein supplements for poultry because of its consistency in nutrient content, its ready availability round the year. Soybean meal is replacing Fish Meal in Aquaculture feeds due to price, consistent availability and it's nutritional properties. Exported Mainly : South Korea, Japan, Sri Lanka, Vietnam, Thailand, Kenya, Singapore, Uk, Malaysia And Maynmar.